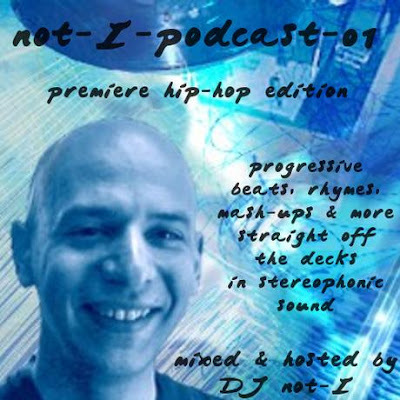 This is a special re-release* of my first podcast, recorded back in 2007 (first released via Podomatic) and featuring quality hip-hop of the conscious, electronic, neo-old-school, non-commerical and underground varieties. It also includes three of my blends/mash-ups, all of which will re-appear on the imminent release of my Collected Mashups Vol. II. This was mixed live with two turntables, one CD-player and a mixer from mostly vinyl sources. It being my first podcast, I naturally made a few beginner's mistakes, but listening again, I'm firmly convinced it stands the test of time, most especially because the music featured here more than adequately passes that test. I call this a *special re-release because: 1.) It's been re-rendered into highest-quality VBR mp3s from the original wave file; and 2.) It's been cut into individual tracks so you can skip to and replay your favorite tracks. 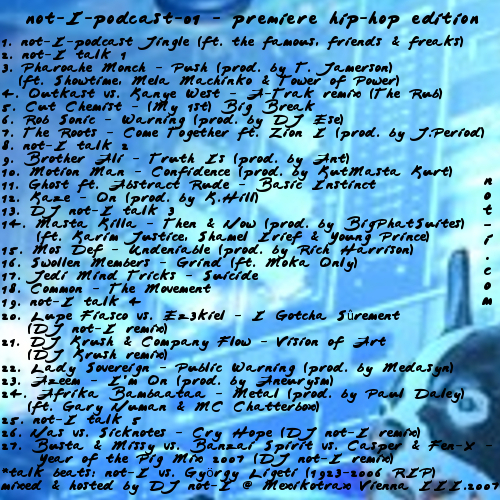 DOWNLOAD (special edition) (27 tracks, 79 minutes, mp3s @ highest-quality VBR, covers, liner notes). An alternative (and possibly faster) DL link is available in the "Comments" section.